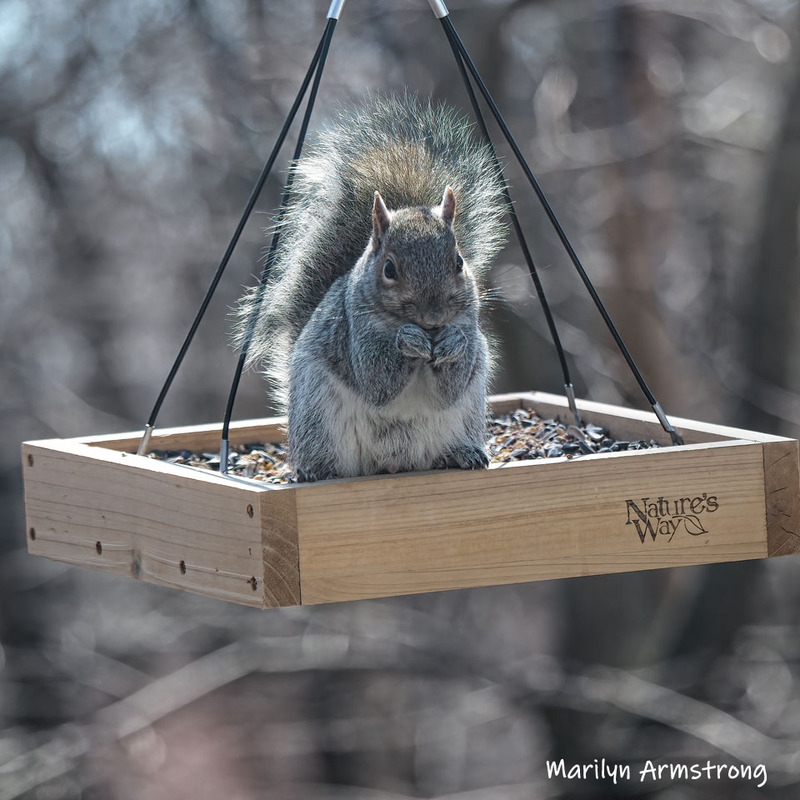 Most of the squirrels who come to hang out on the flat feeder are bigger and fatter. They have scars, some of them relatively new and raw. This was quite a small squirrel. Not scars that I could see, not even a mismatched grown-in area of fur. Maybe still a young one. Not yet a survivor. I wondered how he would do with all the dangers surrounding him. It was like watching your little one and hoping they will survive kindergarten … or freshman year … or … parenthood! That lens is KILLER.., and I love the squirrels. Too bad they don’t make good pets, but fun to watch from afar. They just aren’t good in houses. They make friendly outdoor pets, but they do badly with plumbing and curtains and sofa cushions. And they are just too active for inside living. Owen had a friend in Hempstead who had a pet squirrel for a while until he drowned in the toilet. Plumbing is NOT for squirrels. He was friendly and sweet and adorable, but not designed to live in a house. And so soft and fluffy! I wonder how long the newest squirrel will survive? Can you ID him from the others? Yeah, Ben. They’re so cute from a distance. That’s where they’ll stay unless they summon up grit to come closer. If you put out the right food, they might drop by. You just never know. 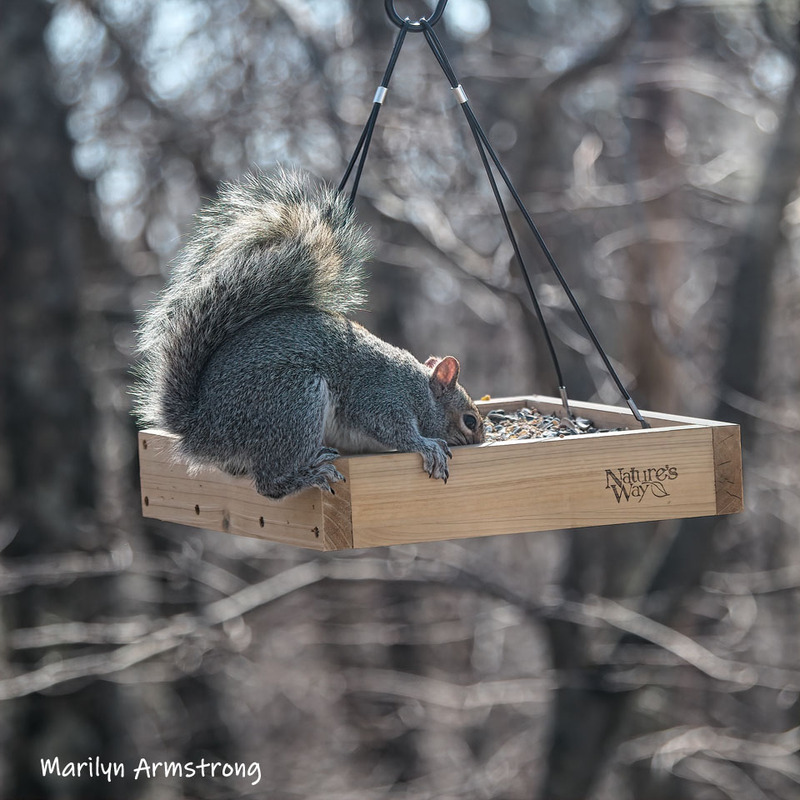 Marilyn puts out the best feed bag in our Valley. The word is out: Good eatin’ here. I think very young. And rather small compared to the other squirrels I’ve met. What a cutie! I love the way they hold their hands when they eat. Very agile little hands. Lot of tiny bones, too. 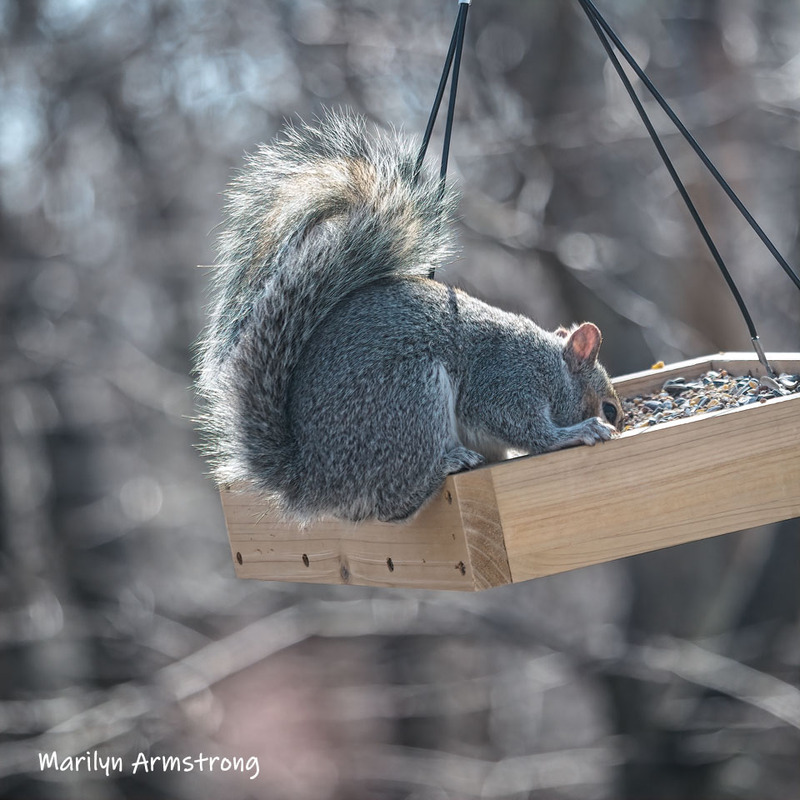 I just checked out the cost of bird food at Home Depot – boy that’s expensive and to know how much these guys can eat – it enough to bankrupt you. It IS expensive. I buy it via Amazon where it’s a little cheaper AND they deliver (it’s also HEAVY! ), but it’s a lot of money! And they don’t like the cheap stuff, either. I figure they should be grateful for food at all, but apparently, they have definite preferences. I gave up on the cheap stuff and buy the expensive stuff. You’re turning them into epicures, Marilyn…. I may have mentioned this before, but I once trained a family of squirrels to come to the bedroom window and accept peanuts from my hands. My kids loved it. The landlord not so much. They will do almost anything for peanuts and most kinds of fruit. I think he or she may indeed be that!